Just like Bessy and Keiry, featured in the photograph above, we will ensure that your pet enjoys their stay as much as you. We accept up to 3 pets in our ground floor bed and breakfast rooms, Clotted Cream and The Ayrshire self-catering apartments. All our canine guests receive their own holiday pack with feeding bowls, towel and biodegradable poo bags. Every canine guest gets a treat especially made by Paws Deli. Our current flavour is New Forest Venison and Plum, yummy. Most guests will want to bring their own pet’s bed, but if you forget we have dog mats to offer you. Our mats have anti-bacterial properties with removable covers, so they are washed and fresh for the next canine guest that comes to stay. Occasionally guests forget to bring a lead or Wellie boots. Don’t despair we have spare leads and a selection of boots we can loan you. We also stock Purina if you forget your canine companions food. For those who are staying for a week or longer we can offer Oscars home delivery service. 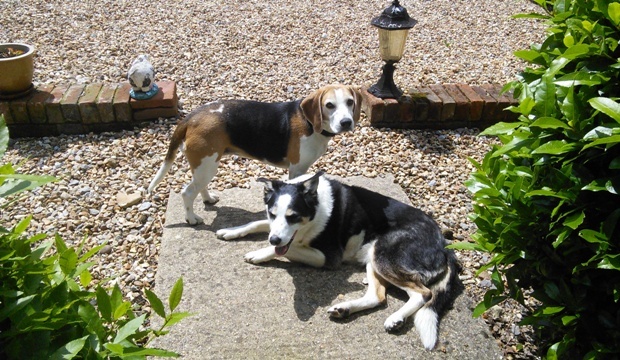 Guests attending a wedding or visiting Peppa Pig might be interested in our pet sitting service. Rest assured we are licensed with Test Valley Borough Council to offer pet care. The service is available at £5 for half a day and £10 for a full day’s care. We promise to walk your canine companion at least twice a day and feed or administer any medicine. In partnership with Barking Mad we offer cruise guests a pet sitting service for the duration of their cruise. This service is only available to guests who have booked their cruise through Packridge Cruises. Guests can choose as much or as little of our cruise package that suits their needs. The closest dog friendly pub that we recommend is the Luzborough House just 1.5 miles away. The New Forest, Romsey and surrounding area has a range of eateries and pubs that are dog friendly. We have a list of tried and tested dog friendly pubs but in the meantime click here for a map of pubs that accept dogs in our local area.